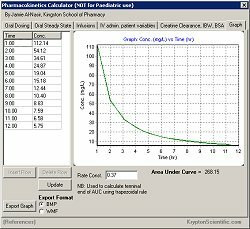 The Pharmacokinetics calculator is a desktop application that can calculate various Pharmacokinetic variables with ease. Graphs may be generated from Oral steady state parameters and multiple dosing. The program has an easy to use interface and also provides references for the calculations used.